Mt. Pintaubo (Philippines) erupted in 1991 and deposited up to 6km cubed of pyroclastic material in the drainage basins of the volcano. One of these drainages, The Pasig Potrero, is a river system that flows off the eastern flank of the volcano. 14km downslope of the summit crater, the river expands into a wide, braided alluvium over half a kilometer in width. 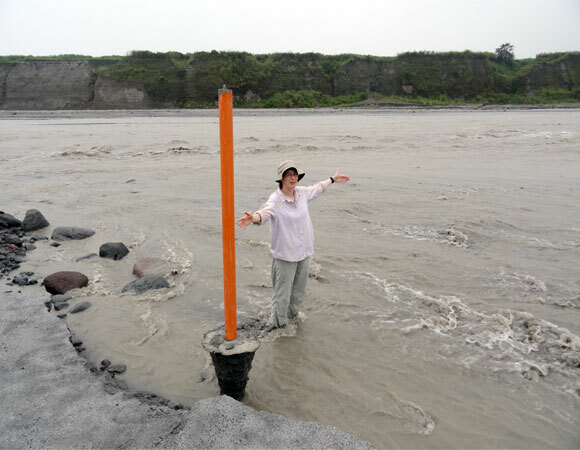 Dr. Karen Gran has been monitoring the Pasig Portero since the eruption to understand the evolution of the river channel as sand-rich pyroclastic deposits are eroded and transported downstream. 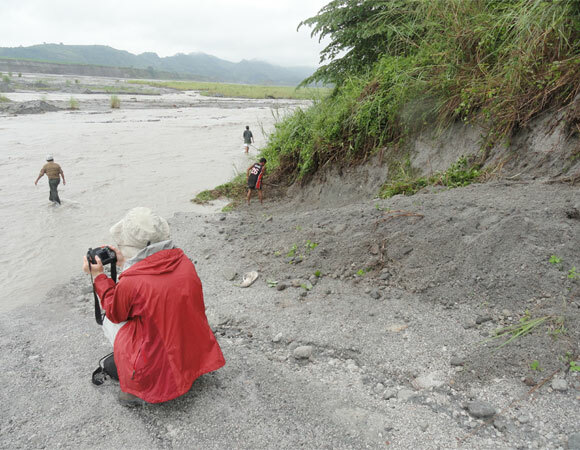 This field trip was part of a larger, multi drainage-basin study examining the processes by which river channel recovery (return to equilibrium conditions) occurs on Pinatubo. 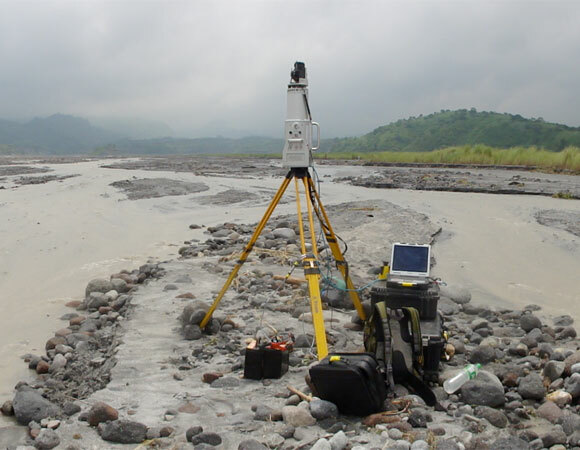 Terrestrial laser scanning was conducted on a 1km long section of the Pasig Potrero alluvium. Data gathered from the scans will help determine if TLS is a valid method for measuring current alluvial topography that can be compared to future scans. If so, this will help quantify sedimentation and aggradation of the river channel through time. In addition, repeated scans of smaller sections of the alluvium will be used to track braid migration on a daily time scale. Figure 1. The Riegl Z620 set up on a sand bar in the middle of the Pasig Potrero. Trying to grab just one more scan before the onset of rain. Photo credit Sarah Doelger. Figure 2. 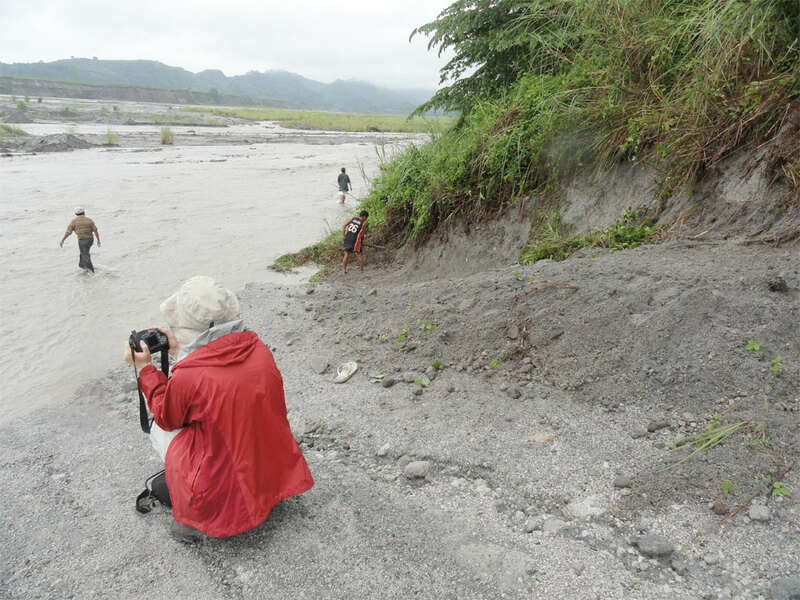 PI Karen Gran watches as part of the field team looks for a way to access the river bed. Photo credit Sarah Doelger. Figure 3. 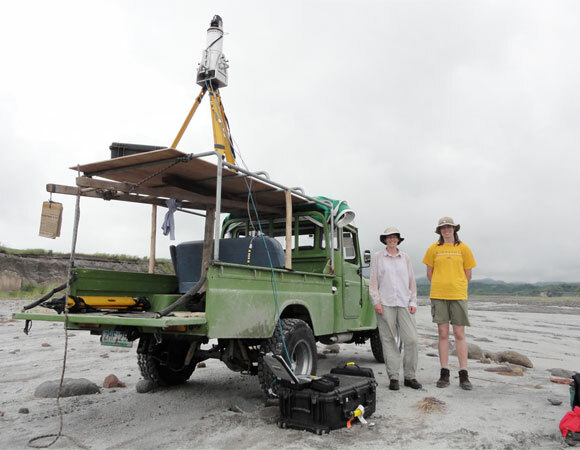 PI Karen Gran and PhD candidate Stephanie Day stand keep stand watch to make sure that nobody bumps the truck when scanning is in progress. Photo credit Sarah Doelger. Figure 4. 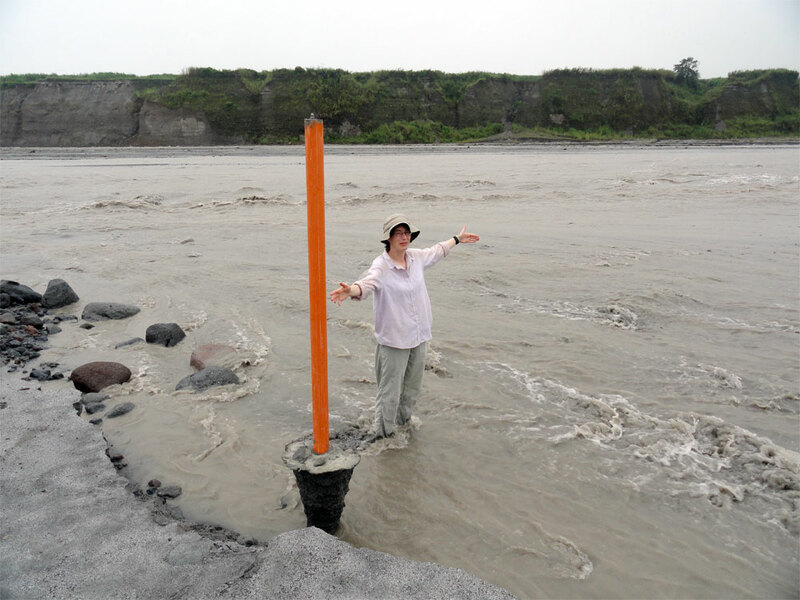 Karen Gran demonstrates where the edge of the sand bank was (at Karen's left hand), just two days previous. Photo credit Sarah Doelger. 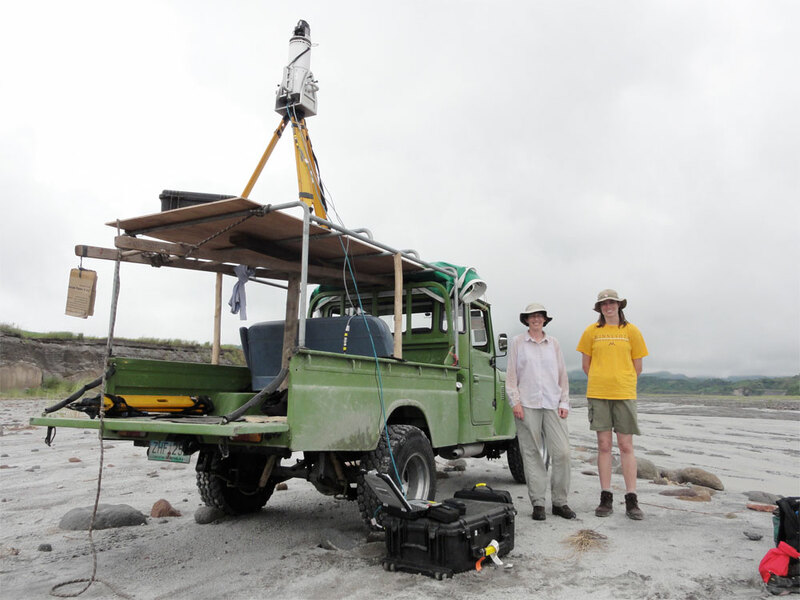 Gathering scan data proved very challenging in June, which was at the beginning of the rainy season. Scanning cannot be conducted in the rain since the laser beam that emanates from the scanner reflects off of the raindrops and not the intended land targets. We received weather from three consecutive regional tropical storms that rained us out for a solid week of the two weeks we had to collect data. The heavy rains also washed out our road access to the river bed and made reaching certain parts of the alluvium difficult. The sun appeared for our last week of field time, enough that we were able to collect a bare minimum of usable data.